Switzerland covers an area of 41'285 km². 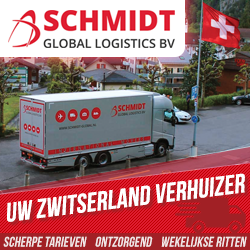 For Switzerland a valid passport or a valid tourist card is required. A visa is for Dutch, Belgians and Luxembourgers not required. The capital of Switzerland is Bern. There are various types of climates in Switzerland from a polar climate in the mountains to a Mediterranean climate in Ticino. Generally, there is a transition from land to sea climate and in the higher parts of the Alps is a mountain climate. The voltage in Switzerland is 230 volts. To connect equipment you'll often need a plug adapter, since Switzerland has different plugs and sockets. The cuisine of Switzerland has many facets. While some dishes such as fondue, raclette or rösti are known throughout the country, each region has its own gastronomy according to the differences of climate and languages​​. Traditional Swiss cuisine uses ingredients similar to those in other European countries, as well as unique dairy products such as gruyère of Emmental, produced in the valleys of Gruyères and Emmental. In Switzerland usually kids start Kindergarten at five, they attend 2 years. Then they start primary school at age of seven, it takes 6 years. Secondary school takes another 3 years. Some kids go to a higher school, either after primary school for 5 years or after secondary school for 4 years. After this, they may go to university. Those who do not go to university usually start an apprenticeship which takes between 2 and 4 years. Boys and girls in Switzerland attend the same classes; they are not separated except for gym at secondary school and universities. Kids are done with school if they chose to be at age 16. The literacy rate for Switzerland is close to 100%. Switzerland is officially named the Swiss Confederation, it is also called "Confoederatio Helvetica", therefore the abbreviation "CH". The name Switzerland is derived from the name of one of the founding cantons, Schwyz. The white cross of the Swiss flag is a symbol for the cross Jesus was put on. The red color is a symbol for his blood. Administratively, Switzerland is a federal republic consisting of 26 cantons. The country is not a member of the European Union. Business in Switzerland: Shake hands (perhaps nod. Family/friends in Switzerland: Embrace, kiss (recently, people started to kiss three times on the cheek (left, right, left)). Switzerland has approximately 7.7 million inhabitants. Switzerland is not a nation state, there is no "Swiss ethnicity". Instead, Switzerland is a society of essentially four native ethnic groups: Swiss Germans (65%), Romandiërs (18%), Italian-Swiss (10%) and Rhaeto-Romans (1%). End of 2005, there were 17,055 people with the Dutch nationality and 9,822 people with the Belgian nationality living in Switzerland. The largest lakes in Switzerland are Lake Constance and Lake Geneva, but both of these lakes are shared with other countries. The largest lake lying entirely in Switzerland is Lake Neuchâtel. The national and official languages ​​of Switzerland are German (spoken by 63.7 percent of the population), French (spoken by 20.4% of the population), Italian (spoken by 6.5% of the population), Romansh (spoken by 0.5% of the population). The German that is spoken by the German-speaking people is Swiss German, which in many respects differs from High German and also has major differences between the various towns and villages. The Swiss French differs in details on the official French. The Romansh is spoken in a part of the canton of Grisons. Switzerland is an Alps country. The highest mountains are in the south and east of the country. The highest point is the Dufourspitze (4634 m) in the canton of Valais. Other famous mountains in Switzerland are the Matterhorn, the Jungfrau and Eiger. In the northwest is the Jura. The north and center of the country are less mountainous and therefore the most densely populated. About 3000 km2 of the Alps is covered by glaciers and eternal snow. The largest glacier is the Grosse Aletsch glacier with an area of 115 km2. The national anthem of Switzerland is "Trittst im Morgenrot daher". Aaccording to the most recent count (2000) was at that time 42% of the Swiss Roman Catholic, 40% Reformed, 2.5% are members of a so-called Frei Kirche (Protestant church without a special relationship with the government), 4% Muslim, 1% belongs to another religion and 11% is not affiliated with any religion. The Roman Catholic Church in Switzerland does not have its own church province, but has six straight from the H. Chair dependent dioceses. In Geneva are the WCC and the Lutheran, Reformed and Methodist world unions. The main rivers are the Rhine with its tributary the Aare, and beyond the Rhone and Inn, all of which originate in Switzerland. On most highways in Switzerland a vignette is required. There is a toll for motorways, which in 2007 costs 40 Swiss Francs and is valid for 14 months, from December in year A, B throughout the year, and January of year C. Some mountain passes require toll. Also for the tunnel La Drossa between Switzerland and Italy, and the Great Saint Bernard Tunnel toll must be paid.